I’m excited about this new tradition that we started last October at General Conference time. Last year I made a make-shift b/w print that barely made it out of my printer. But we kept it up for 6 months. This week, I created a new one that will hopefully last longer and be easier to erase/change in 6 months. I love that I can use a wet-erase overhead projector marker and it doesn’t wipe off when our shirt bumps the glass. 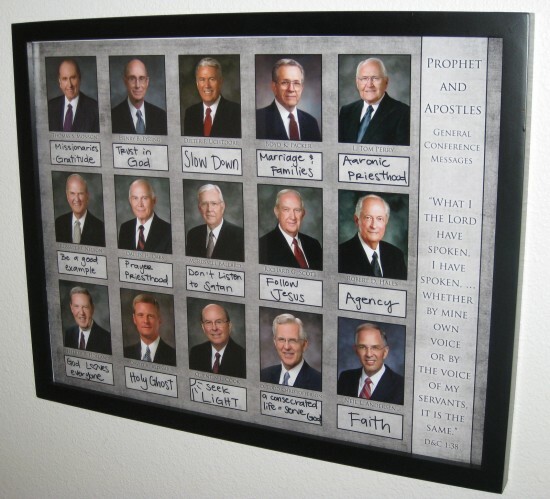 I love that we have a quick reference of what we learned in General Conference. Hopefully the kids look at it occasionally since I hung it at their eye level. 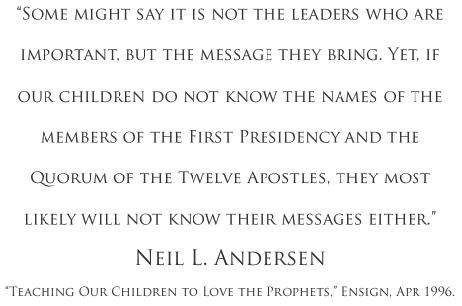 I love that my kids can learn the names of the apostles. Here’s Hannah’s video version on the LDS Apostles song to the tune of 10 little Indians. We taught it to the primary kids on Sunday when we had a lesson on our Living Prophet today. They learned it so well and loved singing it fast. Another tradition the kids wanted to continue from last year is having our “Conference Mix”. 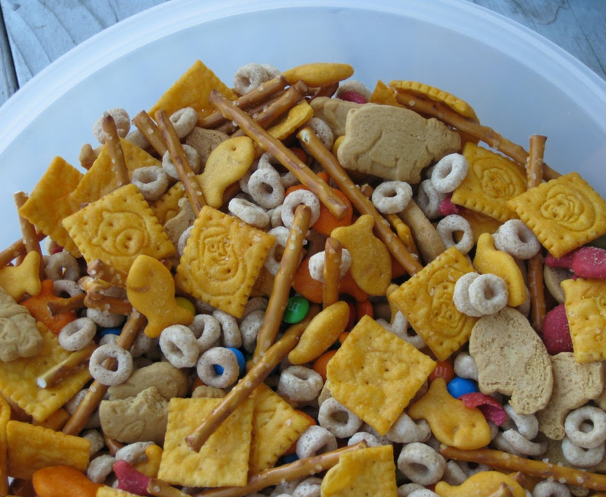 We just throw a bunch of crackers, pretzels, raisins, m&ms in and it keeps the kids satisfied for a good few hours. p.s. if anyone is interested, I posted the freebies to the apostles poster and 4×6/5×7 prints on my Simply Fresh Designs blog. love it Heather! Thank you! I am SO glad you posted it as a freebie…you are so very generous & my family will benefit because I am going to print that poster. Thanks a million! and congrats on baby #5!!! I would love the file for the poster. I COULDN’T FIND IT ON YOUR OTHER BLOG. Could you send me the file? Monday… Monday… my van is filled with… liquid gold?